Spa Club Bor Hotel in Velingrad spa resort in the Rhodope mountain, Bulgaria. SPA CLUB BOR is the first Bulgarian spa hotel certified by the European Spa Association! SPA CLUB BOR – Velingrad already welcomes its guests. 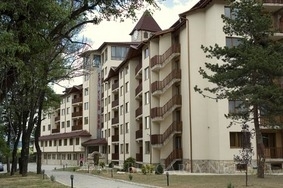 It is the newest 4-star hotel complex, combining the healing mineral waters of Velingrad and the divine nature of Rhodope mountain with the luxurious athmosphere of the biggest spa-centre in Bulgaria, 90 cosy apartments and 60 studios, all of them – supplied with warm mineral water. Each studio (type – large double room) has two single beds (or one large “French bed”) and a bathroom with a bath tub (or a shower cabin) and a lavatory; soft and comfortable furniture in warm colours. Some of the studios have a balcony. Each apartment has two cosy rooms – the first – a bedroom with a large bed, and the second – the living room; bath room with a bath tub and lavatory; a balcony. The spa-centre is in Roman style, which kept the ancient healing spring of Saint Pavel. All the procedures are with mineral water. The spa centre consists of: therapeutic and diagnostic section, balneology section with hydro-massage bath tubs, Vichi shower, Cleopatra bath tub, pearl bath tub, therapeutic magnet bath tub with chromo-therapy; built-up beds for “shirodhara”, honey-, oil-, mud- procedures; physiotherapy section, kinesi - therapy, sauna, steam bath, Turkish bath with hamam, fitness centre, individual massage rooms, solarium, Jacuzzi; “beauty” saloon for cosmetic procedures. The indoor swimming pool with mineral water, at 32 – 38 degrees. Tavern “Bor” offers traditional Bulgarian cuisine, and the restaurant impresses with the sophisticated dishes of one of the best chefs in Bulgaria. We can also organize your seminars and conference, “team building” – meetings, company events etc.